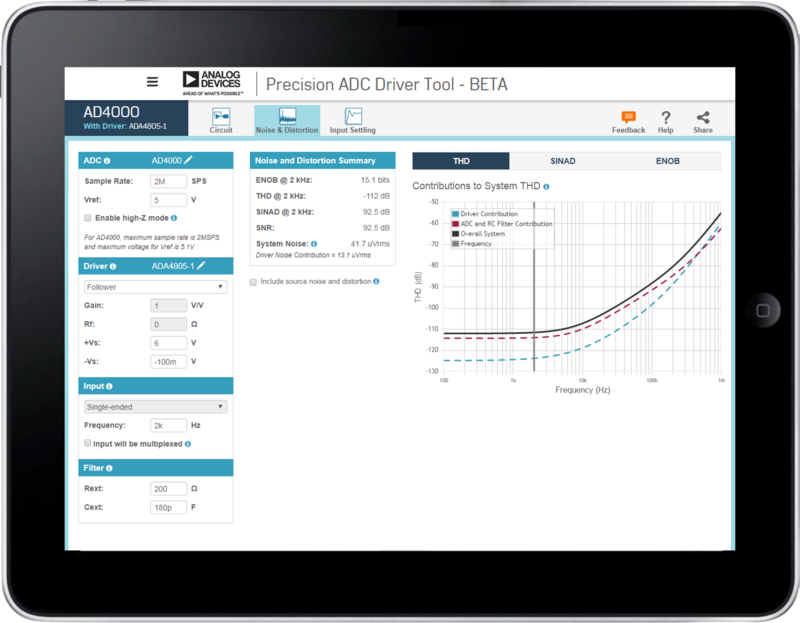 Use the Precision ADC Driver Tool to simulate the performance of precision ADC and Driver combinations. Potential issues with driver selection, kickback settling, and distortion are flagged, and design tradeoffs can be quickly evaluated. Simulations and calculations include system noise, distortion, and settling of the ADC input. Performance Gallery is a web application to aid in the distribution of performance data. Finding measured performance under specified operating conditions has never been easier. Use the intuitive filtering capabilities to quickly narrow the search space. Experience dynamic plots with zoom, pan, mouse-over traces, and more. 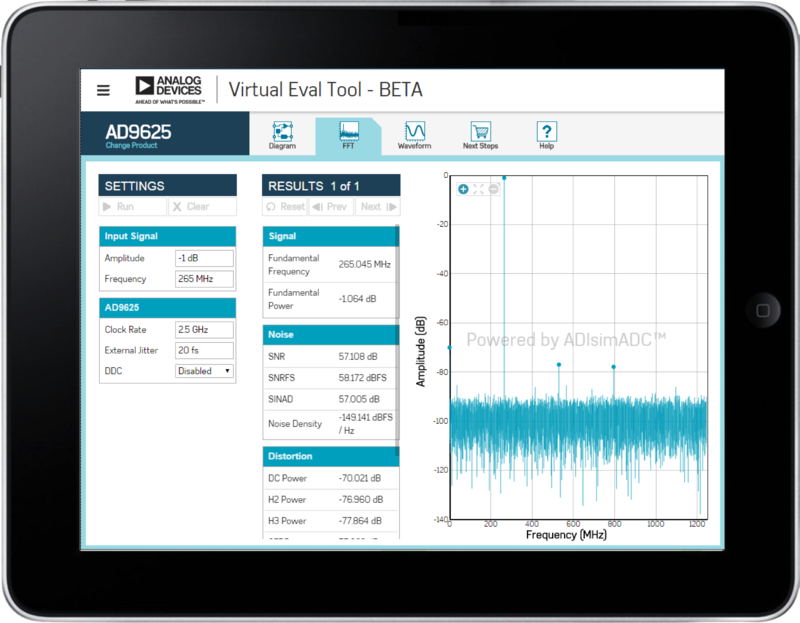 Virtual Eval is a web application to assist designers in product evaluation of ADCs and DACs. Using detailed models on Analog’s servers, Virtual Eval simulates crucial part performance characteristics within seconds. 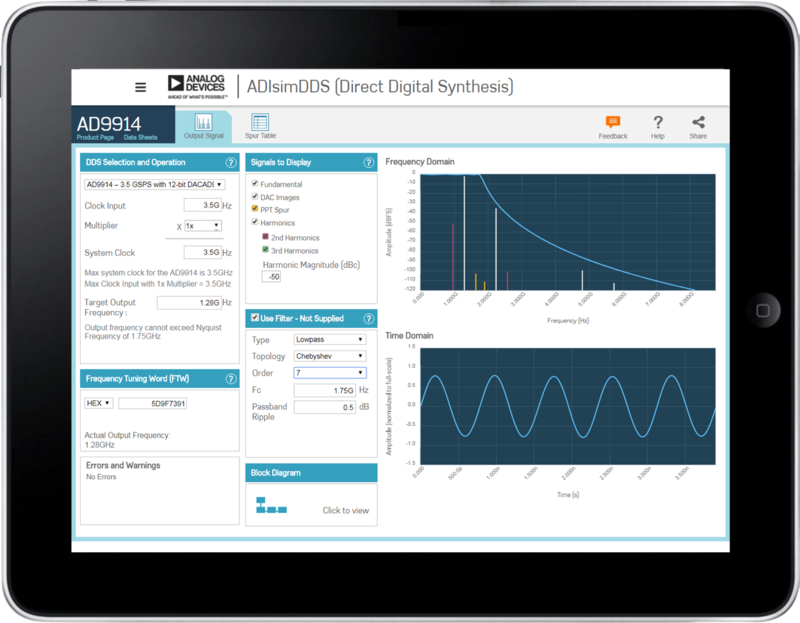 Configure operating conditions such as input tones and external jitter, as well as device features like gain or digital down-conversion. Performance characteristics include noise, distortion, and resolution, FFTs, timing diagrams, frequency response plots, and more. 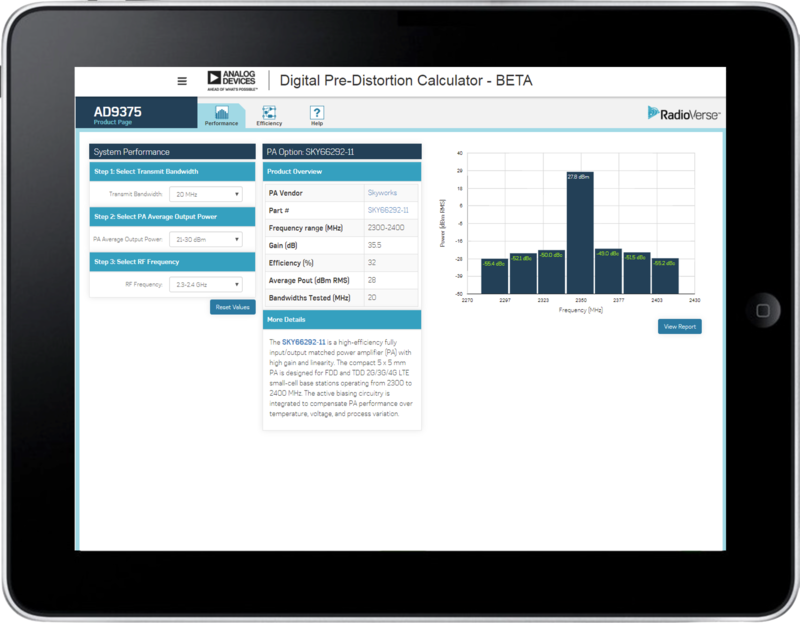 Digital Pre-Distortion (DPD) Calculator shows the improvement in linearity that DPD provides for a wide range of signal configurations and power amplifier output power ratings. 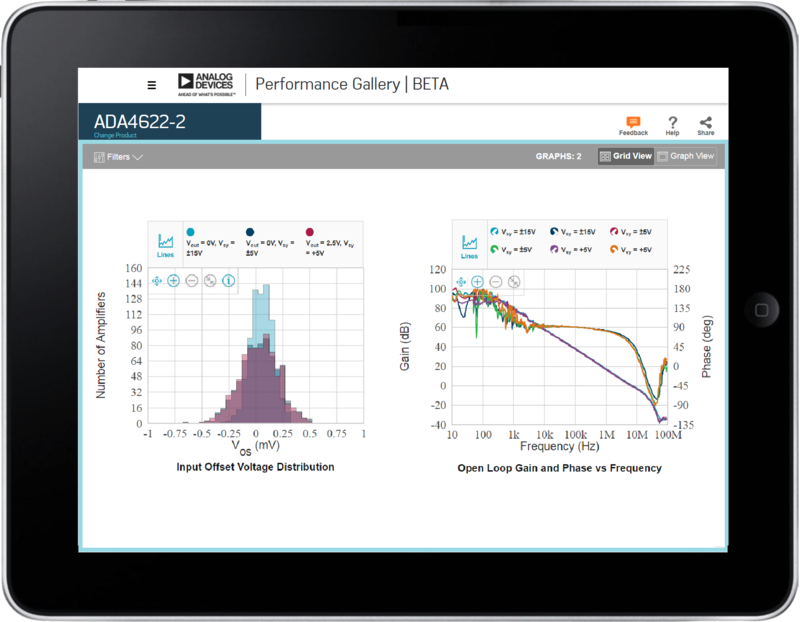 Use the drop-down menu in the Performance tab to select your linearization scenario, and the Performance Tool will display RF spectrum plots and signal measurements demonstrating the results of linearization. Instrumentation amplifier datasheets typically show a graph (or several variations) of the Output Swing vs. Input Common-Mode Voltage, also known as the Diamond Plot, which is a comprehensive graph of all external and internal headroom limits. 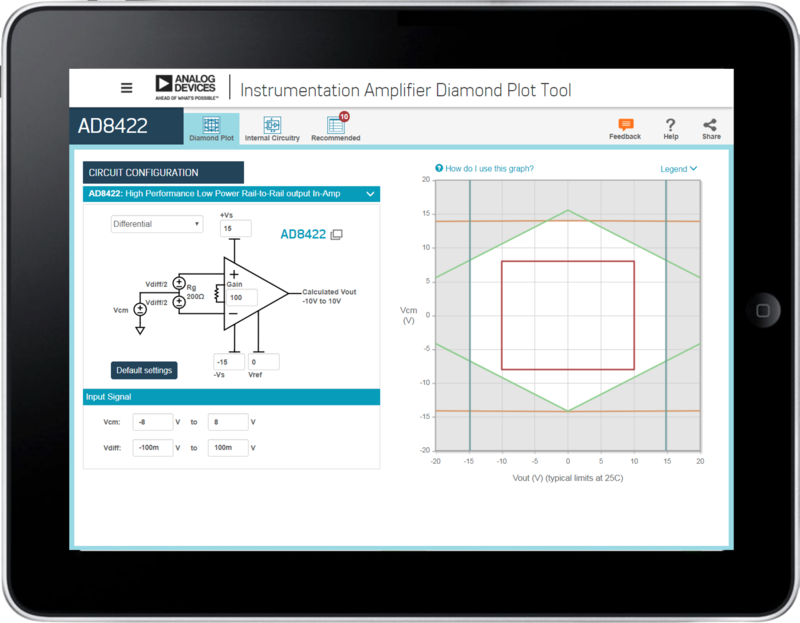 Given enough basic information about a circuit, the Diamond Plot can be adjusted for various Supply Voltages, Gains, and Reference Pin Voltages.